Pyle PT1100 1000 Watt Power Amplifier. This 1000-watt amplifier is rack mountable! Plug in up to two microphones using the front ¼' jacks. Easily adjust the treble, bass, and balance with the front-mounted rotary faders. Speakercraft BB1235. Speakercraft Big Bang Power 1235 Amplifier. InstaLLock connectors eliminate the hassle of connecting multiple wires onto the back of the amplifier. Instead they can be easily connected to the InstaLLock connector, which is later plugged into the back of the amplifier. Item has been tested and is in great working order. No accessories other than the remote are included. The unit is in good condition and functional. It has been removed from a fully working environment. Please see pictures for details. MP3 Digital Audio File Compatibility. Optical (Digital) Audio Output. Aux (3.5mm) Input Jack. (2) Pair RCA (L/R) Audio Inputs. Video Outputs: S-Video, RCA YPbPr (Component Video). Digital LCD Display. Niles SI-1230 Series 2 12-channel multi-room power amplifier. BARELY USED in MINT condition! 40 watts RMS per channel into 4 ohms, all channels driven. 30 watts RMS per channel into 8 ohms, all channels driven. Pyle - PCA3. 2x15W 1% THD and 2x75W MAX. This mini stereo power amplifier provides up to 75 W of power on each channel at 4 ohms. Connect your inputs using the RCA jacks. Outputs over standard speaker push jacks. Authoritative power in a whole-house audio system no longer requires sacrificing valuable rack space. Architect Model 1680 EQ. 16 channel multi-zone power amplifier with eq. Equalizer Frequencies: 75Hz, 250Hz, 700Hz, 2.5kHz, 12kHz. Speakercraft BB865. The BB865 incorporates discreet power supplies to balance power between channels. Discreet output devices allow the amplifier to drive low impedance loads with very low distortion. 50 watts per channel at 8 ohms, stable to 4 ohms. Multi-zone amplifier, Ethernet cable, power cord. Supports up to eight zones (six powered zones, two pre-amp only zones). up to eight zones. Add the SNP-2 steaming network player to access popular streaming services, internet radio and personal music collections. Pyle PD1000A 1000 Watt AM-FM Receiver w/ Built-in DVD/MP3/USB. Model: PD1000A. MP3 Digital Audio File Compatibility. 4-Channel Receiver System. USB Flash Drive Reader. AM FM Antennas. Preamplifier Receiver. New in opened box. only what is pictured. Impedance Setting (H571).Variable 2X/4X/8X/16X. Impedance Setting (H572).. Variable 1X/2X/4X/8X. NO EXCEPTIONS. Gently Used RTI AD-4x in like new condition. Less than 6 months old with very little play time.This unit was pulled from a new install that required a larger Zone amp to cover the whole house. Very low hours on this unit and in mint conditions, no dings, scratches or blemishes of any kind. This unit must be used with the Nuvo NV-E6DKPC keypads and network hub which are NOT included. No remote will be furnished nor anything that you do not see in the pictures. This unit will work in conjunction with a Nuvo E6DX expansion unit as well for a total of 12 zones of stereo output. This unit must be used with the Nuvo NV-EKP keypads and network hub. I will include a power cord, however, no remote will be furnished nor anything that you do not see in the pictures. This unit will work in conjunction with a Nuvo E6X expansion unit as well for a total of 12 zones of stereo output. Open Box NUVO NV-E6DM Whole House 6 Channel amplifier system included are 6 NV-E6DKPC. High-end power stereo amplifier EMPERADOR AUDIO, brown marble housing, AC adapter,110-240v,made in Ukraine. Nice sound,impeccable appearance ! Power output: 2 х 10 W (4 Ohms). Frequency response: 1Hz to 40 kHz ( /-3,0 dB). High-end power stereo amplifier EMPERADOR AUDIO ,marble housing, AC adapter,110-240v,made in Ukraine. Green marble from India. Nice sound,impeccable appearance ! 50kohm input imphedance. Power output: 2 х 50 W (4 Ohms) or 1X170. This unit must be used with the Nuvo NV-EKP keypads and network hub. No remote, keypads or hub will be furnished nor anything that you do not see in the pictures. This unit will work in conjunction with a Nuvo E6X expansion unit as well for a total of 12 zones of stereo output. Unit is untested but believed to be functional. MP3,Pod, CD player input jack. Jack input: 1/8" (standard stereo jack). 1 x Hi-Fi Stereo Amplifier(Power adapter is not included). 200W max power output. 2.1CH, Low distortion. Total harmonic distortion: <>. It also has a jack for plugging your MP3, MP4, iPod or CD player. Jack input: 1/8" (standard stereo jack). Frequency response: 20Hz-20KHz. Input impedance: 47K. Material: lightweight aluminum. DC Input: 12V-18V 2A. Jolida JD 1000A 100W Per Channel. A Non over-sample tube DAC, and a bamboo enclosure bookshelf with flat response, ultra fast transient, and highs (seas tweeters) that are to die for. And this Jolida just push them to a new height. 12 Channels @ 100 watts each. Amp and power cord only. No rack mounts. There are rack mounting kits for 1U (RMK-1), 2U (RMK-2) and 3U (RMK-3) case sizes. 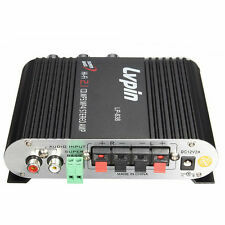 URC Network Multi-Zone Amplifier | 50W x 12 Channels. This amplifier provides high-powered crystal clear audio from any music source. Niles SI-1230 is a work-horse in the custom integration world. Able to drive 6 stereo audio zones or 12 individual single speaker zones independently or at at once. The amp is rated at a solid 30 watts per the 12 channels. Trust eBay for fast shipping and free tracking! Headphone imphedance: 8.600ohm. Nice sound,impeccable appearance ! Inputs: 2x RCA line inputs. Output power: 1W. The Adagio Audio Expander (AAE) from Crestron® is a high-performance audio distribution processor with integrated multi-channel amplifier. Programming a complete audio distribution system is a quick and simple task using Crestron SystemBuilder™ software. It also has a jack for plugging your MP3, MP4, iPod or CD player. Jack input: 1/8" (standard stereo jack). Frequency response: 20Hz-20KHz. For More, Link Below. Original manufacturer's serial numbers intact. 200W max power output. 1 x Hi-Fi Stereo Amplifier(Power adapter is not included). DC Input: 12V 2A. MP3, iPod, CD player input jack. Jack input: 1/8" (standard stereo jack). Frequency response: 20Hz-20KHz.
' ---2x15W 1% THD and 2x75W MAX. ---BLUE LED output level display ---POWER ON/OFF switch and LED indicator ---Compatible With Any Audio/Computerize Devices ---MP3)Via 3.5mm To RCA Converter ---MASTER volume control ---TREBLE and BASS controls ---PUSH TYPE speaker output ---RCA jack input ---115/230 VOLTAGE selector ---Dimensions: 7.48''W x 2.87''H x 5.39''D. Audio Source AMP100VS 2 Channel Amplifier (Black). MAIN / INTERRUPT priority input switching. MAIN auxiliary output. Signal sensing "Power On" and Trigger mode.